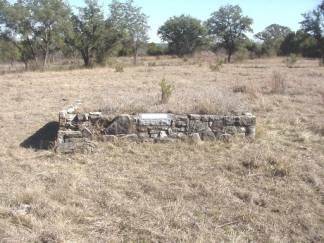 You have listed a "Pantar cemetery" near Paluxy. This is a plot that contains a woman and her stillborn child. 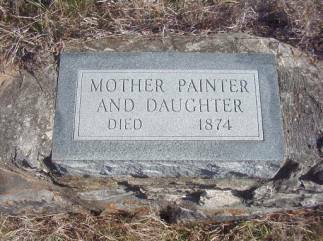 The woman was my Great Great Grandmother, Hannah Gunnels Painter, and her stillborn child was a daughter that they named Elmira. Hannah was the wife of Leander Painter, who was the first minister of Rock Church and is buried in Rock Church cemetery; Elmira is his daughter. Hannah died as a result of labor. At the time of their burial, the Rock Church cemetery was to be at that location. It was one of several sites that the cemetery, through disagreement and Lord knows what, was moved to before finally being located where it is now. The result of the several relocations can still be seen today in the lone graves scattered along the road next to where Hannah and Elmira are buried. The name was initially carved into a large piece of sandstone by my Grandfather Vester Thomas Furlow, to serve as a headstone. Bless his heart, he spelled the name as best he knew at the time and misspelled it 'Mother Pantar and daughter". My Father, Thomas D. Furlow and uncle Denzy McCleskey replaced the sandstone marker with a gray granite stone in 1978, the one that is currently in place. All of this was before I found the actual names, and those came from a tape that was made of my Aunt Cora Cochran in 1979 when she was 100 years old. Aunt Cora was my Great Grandmother's (Cynthia Ann Painter Furlow's) half sister, of Leander's marriage to Lee Painter (Cynthia's stepmother). Now that I know the actual, or more descriptive, names of the two buried there, I plan on getting a new marker with the information upon it. According to Ms. Edna Earl, who is a daughter of Aunt Cora, Cynthia Ann Painter Furlow was born in what is known today as the old Tinnen cabin. The cabin is being restored by the land's owner Cecil Welborn, and I praise him for this. Regardless as to whether or not she was born in that cabin, it is a piece of Hood county history that Mr. Welborn is spending time and money to keep from disappearing. A correction to make. My Great Great Grandmother's name was not Hannah Gunnels Furlow, but Hannah Aust Furlow. Now, here's the twist that has confused everyone for decades. In the 1850 Stoddard County, Missouri census William Gunnels and family is listed. He has a daughter, Hannah, who was 21 months old. ALSO LISTED is Hannah Aust, apparently a newborn. Her brother, James Aust, was one year old. I don't know what happened to the Aust children's parents, but apparently the Gunnels took them in. In the 1860 Erath county census, we find the same Gunnels family. Hannah Gunnels is not listed, as she probably had married Mr. Tinnen by then. But, Hannah Aust is listed. Though she is shown to be 8, she would have been 10 by then. We believe this Hannah, not Hannah Gunnels, to be the Hannah that married Leander Painter, and is buried in the Painter cemetery. Also, the daughter that is buried there has been called Elmina and Elmira. AS the name Elmina shows up in the Painter family prior to the marriage of Leander and Hannah, I'm inclined to believe that the correct name is Elmina. Frank, we need to make that trip out to the cemetery sometime in the near future. Let me know when.